Alexis Valdez was charged with first-degree murder Thursday after authorities said he dismembered 41-year-old Sylvestre Diaz-Hernandez, his aunt's boyfriend, in the 2500 block of North Kildare Avenue. COOK COUNTY CRIMINAL COURTHOUSE — A Chicago teen murdered and mutilated his aunt's live-in boyfriend on Christmas Day — and then left his head and other parts in her bed because "he wanted to leave his aunt a present," prosecutors alleged Friday. The decapitation was the grisly culmination of a feud between 18-year-old Alexis Valdez and his aunt's boyfriend, Sylvestre Diaz-Hernandez, 41, authorities said. Police went to the home that the three shared early Christmas Day after Valdez called 911 to report a dead body in the house, prosecutors said. When the operator asked him if he had tried performing CPR on the victim, Valdez laughed and said the body had been decapitated, prosecutors said. 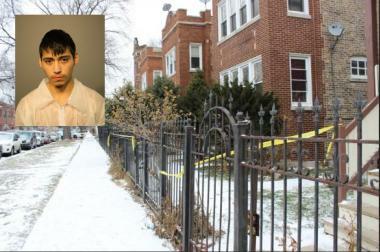 When police arrived they found Valdez covered in blood on the home's front porch, authorities said. "Shouldn't you arrest me before you ask me questions? Because I just killed a man, and he's in the basement," according to a police report. Valdez then slammed an iPad he was holding to the ground, shattering the screen, the report states. The initial details of the crime got more gruesome in court Friday when prosecutors laid more details. Assistant State's Attorney Kingsley Sawyers said Valdez lived in his aunt's house with her and her boyfriend, Diaz-Hernandez. Valdez was supposed to work and help pay household expenses, but didn't, leading to tension in the home, Sawyers said. Eventually, Valdez's aunt asked him to move out, Sawyers said. On Christmas Eve, the aunt went to a party, and Diaz-Hernandez went to visit his family. Valdez stayed at home drinking, and got angry about having to move out of the house, Sawyers said. When Diaz-Hernandez returned home, he found that Valdez had drank all of the beer in the home, Sawyers said. Diaz-Hernandez and the teen went out to a drugstore to buy more, Sawyers said. Before they left to buy more beer, Valdez hid a hammer by the door, and he used it as a weapon to bludgeon Diaz-Hernandez in the head when they came home, Sawyers said. He then covered up the windows and played loud music as he gouged out Diaz-Hernandez's eyeballs with his fingers and cut off the man's ears, nose, mouth, arm, hand and head with a knife and saw, according to charging documents. Sawyers said Valdez then put Diaz-Hernandez's body parts on his aunt's bed because he "wanted to leave his aunt a present," and he later told police he would have killed her, too, if she had found her boyfriend's body. After becoming tired from mutilating Diaz-Hernandez, he called 911, prosecutors said. Police found Diaz-Hernandez's body in the building's basement and discovered a knife at the scene, court documents said. Valdez, who had an address in court documents in the 5000 block of West Drummond Place, was arrested. Judge Peggy Chiampas ordered Valdez held without bail on Friday. The attack came on what neighbors said was normally a "quiet" street in the 2500 block of North Kildare Avenue in Hermosa, police said. Neighbors described the area surrounding the Christmas morning slaying as a mostly quiet block Wednesday, but said things weren't always so silent in the house where the body of Diaz-Hernandez was found. "They used to come outside and fight," said a woman named Martha, referring to the apartment's residents, whom she said she didn't know well. At one point, Martha said she saw a car outside the home with windows that had been smashed in.